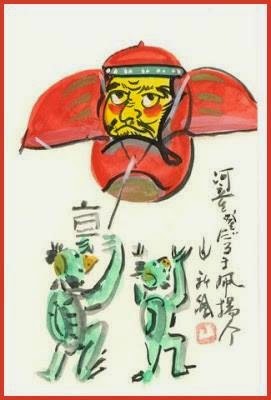 is considered an un-auspicious region and needs protection from real and imagined enemies, fiends and demons.
. Kitamuki Fudo 北向き不動 and the Kimon direction . Why do Oni have horns ? ushi-tora 丑寅 the bull and the tiger. Oni are therefore usually depicted with bull horns and tiger fangs, wearing loincloths made of tiger skin.
. tsuno　鬼の角 伝説　Oni Demon Legends about their horns . 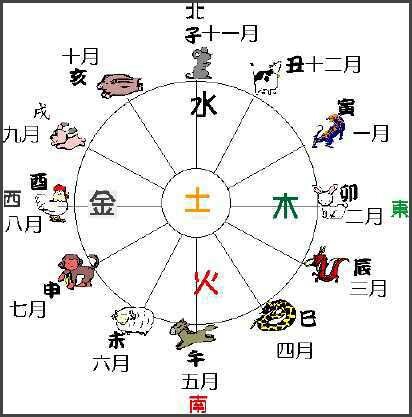 Chinese geomancy (Ch: feng shui), a system for determining auspicious or inauspicious placements and orientations of cities, temples, houses, and graves. In Chinese thought, the northeast quarter is considered to be particularly inauspicious. The northeast direction is known as the "demon gate," which can be loosely translated as the place where "demons gather and enter." This belief was imported by the Japanese and is referred to as Kimon (literally "Demon Gate"). Kimon generally means ominous direction, or taboo direction. In Japan, both the monkey and the fox are guardians against evil Kimon influences. an itinerant deity who changes his main direction of activities.
. nagaya 長屋 /　ながや row house, long house . The outhouse toilet should never be placed in the Kimon direction of a house. There are some trees that should never be planted in the Kimon direction of a house. Others should be planted to bring good luck and avoid disaster. A 汗穴 sweat pore is called Kimon. A Demon can use a 汗腺 sweat gland to invade a human body. daiku no nyoobo 大工の女房 Legends about a carpenter making a mistake. 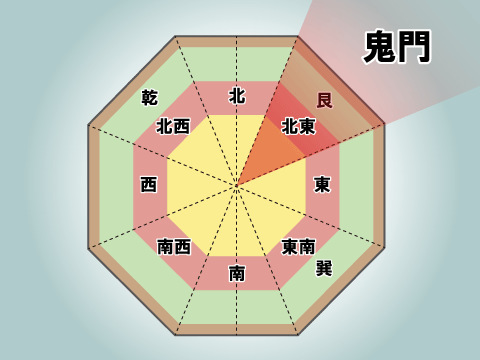 A new house should not face the northern Kimon direction. Never dig a hole in the Kimon direction beside a house. Planting a sarusuberi さるすべり crape myrtle tree in the Kimon direction protects the house from burglars and other disaster.
. sarusuberi さるすべり / 百日紅 crape myrtle tree . lit. "Even monkeys fall from trees! " In 小原村 Obara village, planting a nashi 梨 Japanese pear tree in the Kimon direction prevents people from becoming ill.
. nashi 梨子 Japanese pear, Pyrus serotina . saru ishi, saru-ishi 猿石 "monkey stone"
At the estate of 足沢左十郎 Ashisawa Sajuro in Sannohe, the main building did not have a corner at the Kimon direction. Instead they had placed a stone, saru-ishi 猿石 of about 1 foot size. It was big enough for a monkes (saru - a pun with 去る to go away of bad luck). If a human touched this stone, he would be cursed, so people tried to avoid walking around this corner.
. kasha カシャ / 火車 Kasha Demon "burning chariot" . When the Kasha demon comes to get hold of a corpse, people shoot an arrow in the Kimon direction to drive it away. Planting an Enju tree in the Kimon direction will protect the home from fire and disaster. enju is a play on words with long life, enju えんじゅ【延寿】. a 大工 carpenter had cut three pillars too short and did not know what to do about it. His clever wive suggested to use kushigata クシガタ（枡形）(masugata) square boxes. He did as suggested and all seemed well at first. But the carpenter was worried that his wife tell about his mistake and cut her head off to keep her silent. The head took off and flew away in the Kimon direction in no time. If you put dirty things in the Kimon direction of your house, you will be cursed by the Deity.
. kimon yoke no keyaki 鬼門除けのけやき . A kitooshi 祈とう師 Kitoshi shaman is called ニチレンサマ Nichiren sama in the local dialect. There was once a family with many ill people and a lot of bad luck. So they asked a Shaman for help. He told them that their local sanctuary for Inari was in the Kimon direction and they should relocate it to the inui 戌亥 north-west direction. They did it and since then all went well.
. Inari　稲荷　the "Fox Deity" . In the Dragon Pond lived daija 大蛇 a huge serpent. It had moved here after 為朝 Tametomo drove her away from 黒髪山 Kurokamisan. Tametomo shot an arrow from this lake into the Kimon direction and it landed at the village 古野村 Konomura. There it stuck in the ground, became a bamboo grove and is still to be seen. A bath tub and the bathroom should not be placed in the Kimon direction, because that will bring bad luck. The story is similar to the one above from Tsukui. But the wife now came back every night via the Kimon direction and appeared in the carpenter's dream to scare him. So he shot an arrow in the Kimon direction. The 角材 squared timbers he cut after that all looked a bit like his wife. The estate of the Lord of Bizen (in Edo) seemed bewitched during the time he was living there. Fire pillars were seen in the garden, rain dripped into the kitchen and sometimes the whole house rumbled and shook in strange ways. The local people rejoiced when the Lord had to move out for his yearly stay in Edo. And every day they held special fire rituals at the long house at the Kimon corner, often calling priests to perform the purifying rituals. When building a new home, people have to take good care of the direction. Nothing should be grown in the Ura-Kimon direction of a home to avoid bad luck. a 匠 carpenter had cut one pillar too short and did not know what to do about it. His clever wive suggested what do to about it. He did as suggested and all seemed well at first. But the carpenter was worried that his wife tell about his mistake and cut her head off to keep her silent. Later he made offerings in the Kimon direction to appease her soul. The mansion had been built with the Kimon taboos in mind. Just before the fire started, the pine decoration at the front gate showed a broken branch and three broken bamboo sticks.
. kadomatsu 門松 pine (decorations) at the gate . To protect the Edo castle, 上野の寛永寺 the temple Kanei-Ji in Ueno was constructed in its Kimon direction. Once a man built his 便所 outhouse toilet in the Kimon dirextion, but he was cursed and died soon afterward. But his voice came at night from the roof, asking to call him back. A carpenter came and dug under the outhouse and found the bones of a dead person. The family buried the bones properly. And the man came back to life. some scolastic japanese good friends told me that "kimon" was the perfect place to hide some imperial secrets about "origins"... some koshinto branchs worshipp "kimon dai myojin". 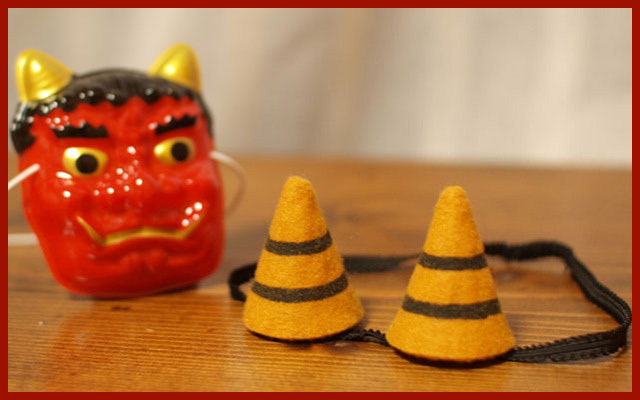 I heard that "oni" was a metaphor in the past to call "korean" migrants who were living in mountains villages in japan!